When I first saw a trailer for Looper, I was pretty damn impressed. Just the concept was interesting: hitmen hired specially to kill and dispose of marks from the future, and one of those hitmen forced to confront his older self. Add in a cast like Joseph Gordon-Levitt, Bruce Willis, and Emily Blunt, and you have an instantly solid sci-fi action movie at the very least. But Looper does not settle for the very least. It instead tackles something science fiction hasn’t been in the movie theater for quite some time: a morality play. Since the dawn of big-budget CGI, science fiction has simultaneously gained a lot of traction with moviegoers, but lost its soul in the process. Read Bradbury or watch original Star Trek and you’ll see what sci-fi used to be: a thinly veiled commentary on our current, real-world society. Sci-fi could ask questions and examine issues through the metaphor of “aliens” or “time-travel” that a lot of folks wouldn’t feel comfortable just thinking about. Issues like racism, sexism, gender roles, politics, religion, poverty, intelligence, and the true worth of humanity have been explored again and again in sci-fi but might be taboo elsewhere. Before ultra-realistic special effects, it was the true power of the genre. And while Looper does have its fair share of special effects and action sequences, they are not the reason to go see it. Instead, a seedy, unattractive possible future world is carefully built, populated with very real-feeling characters that – despite the sci-fi elements – have experiences and emotions we can all relate to. It’s hard to talk too much about the plot of the film without giving too much away. But we first meet Joseph Gordon-Levitt as Joe, one of those hitmen called loopers that blow away people from the future. It is far from a glamorous job, but it pays incredibly well in what seems to be a massive economic depression. It pays even better if your future self is sent back for you to kill, and it means you can retire with a fat stash of gold and live out the next 30 years of your life without a care in the world. It’s what they call “closing the loop.” And while the rewards are big…failure is absolutely not an option. One of Joe’s friends finds this out the hard way as he can’t bring himself to kill…himself….and winds up suffering a far, far worse fate. Joe’s role in the whole thing starts to bring up questions he’ll struggle with throughout the film, especially after he too meets his future self (played by Bruce Willis)…and also fails to pull the trigger. 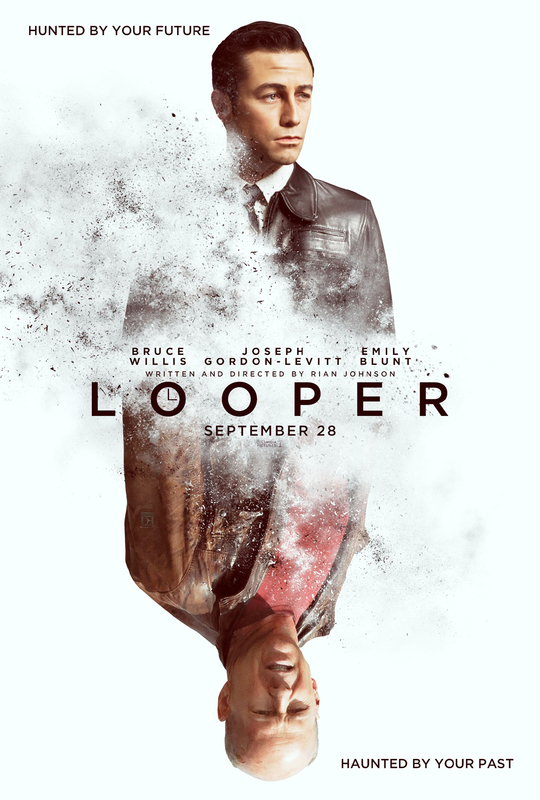 This is what Looper was advertised as, and if it had been just that, it still would have been a very inventive action film. But Old Joe’s story throws a new wrinkle into the mix, and his target another, and another and another…all to the point where you’re never really sure what might happen, which is another impressive achievement for a modern film. Along the way, we take a long, hard look at how far some of us might be willing to go for love, or money, or acceptance, or approval…and how lost we become when we lose those things. 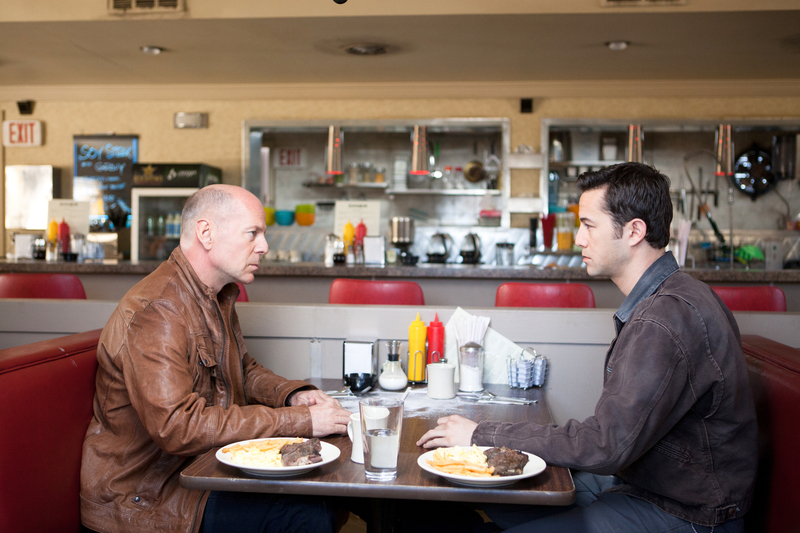 And though it may seem like a pun, Looper takes its time. It builds these characters, shows their habits, their good sides, their bad sides, and how they’ve all been affected by each other and their world. Little details like Sara (Emily Blunt) pretending to smoke a cigarette on her porch, or Joe trying to learn French all go toward making these people seem real as opposed to actors running around in front of a green screen. So by the time all hell breaks loose – and boy, does it ever – we are fully invested in what is at stake for these characters. Looper is not perfect, by any means. Like most time-travel stories, it has its fair share of logic problems. One of the more brutal and visually arresting parts of the film is also one of its most problem-ridden for this very reason. And the make-up Gordon-Levitt wears to look more like a young Willis is a little off-putting at first, but you get used to it. These are, however, small flaws in what is easily one of the most ambitious, clever, thoughtful, and thought-provoking science fiction films in a long, long time. Tags: action, Bruce Willis, Emily Blunt, Joseph Gordon-Levitt, Looper, movies, review, sci-fi, science fiction, time-travel. Bookmark the permalink. I’ve been looking forward to Looper for quite a while now… and hearing that it has the more cerebral aspects of science fiction definitely helps that. I mean, yeah, I’d be on board even if it were just another action film. But if you give me a choice between the next Total Recall and the next Blade Runner, well, I’m going to pick the latter. I have seen some good movies, I just haven’t reviewed them…but it HAS been awhile since I saw a good one in theaters. Couple others I wanna make it out to see too, like Argo and Seven Psychopaths. And yeah, Looper really surprised me. I figured it would be good…but not good in THAT way.